From 2011 to 2012, the Institute of History of Zhengzhou University together with Zhengzhou Provincial Heritage and Archaeology Research Institute and Xingyang Heritage Conservation and Management Office conducted a survey and excavation on a large scale Zhou period moated settlement at Guanzhuang village, Xingyang in Henan province. The settlement was comprised a rectangular outer moat with a “凸” shaped inner moat. The dimensions of the settlement was about 1,300m from east to west and about 1,000m from north to south, the total area was about 1.3 million square meter. Plenty of rammed earthed fragments were found in the inner moat and a well-arranged cemetery from the Zhou dynasties was also discovered in the northeast portion of the settlement. A lot of important artifacts were also unearthed, included bronze, stone, jade, pottery, bone and shell artifacts. 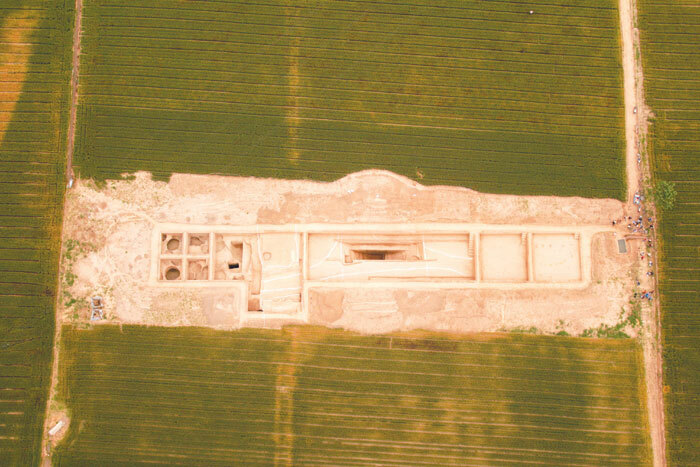 The discovery and studies of the Guanzhuang site are very important to the studies on the development and transition of archaeological cultures in the upper course area of Jialu River in western present day Zhengzhou during the Zhou dynasties. The exploration and excavation was focused on the overall pattern of a large moated settlement in the Zhou period this year. For the time being, the orientation of the “凸” shaped inner moat, the distribution pattern of the cemetery were well revealed. Besides, remnants of an entrance and a path along the moats were also discovered, plenty of rammed earth fragments were found inside the moat. The inner moat was in reversed “T” shape that comprised a square area in north and a rectangular area (orientated from east to west) in the south. The two portions of the moat were both separated and interrelated. The northern portion of the settlement was surrounded by double moats. Its stratigraphy could be divided into 5 layers, unearthed artifacts from middle to late western Zhou period, Spring & Autumn to Warring States period, Tang/Song period and Ming/Qing period. The double moats were separated by sterile deposition. The inner moat was about 16-20m in width. The outer moat was a bit narrower with about 10-12m in width. The sterile deposition in between was about 10-16m in width. Further inward the inner moat, there were an area, 8-10m wide, occupied by pieces of reddish brown clay around the cultural depositions and features of the settlement, from the middle to late western Zhou period to the Spring & Autumn/Warring States period. Deposition from the Longshan culture was also found in a limited area. The double moats surrounded a nearly square area in plan, with north-south direction a bit longer than its east-west direction. The length of the northern, southern and western moat was about 265-270m each. The eastern moat was the longest one with about 310m in length. The total area, including the moats was about 115,000 square meters. This year excavation found a break at the middle of the western moat, this break about 3m wide, cut into the reddish brown clay area. A path, from Warrior States period was found running from east -west direction (L5) on top of the moat. The path penetrated the moats and further extended toward the south and west direction outside the moats. This was anticipated as an entrance after the abandonment of an earlier settlement. The pinpoint excavation of the settlement found a cemetery from the western Zhou to Spring & Autumn period in the northeast corner at the upper portion of the “凸” shape moated settlement. The cemetery could be divided into two sections by its orientation. The two sections were both tightly planned, and a lot of artifacts from the middle to late western Zhou period to the Spring & Autumn period were unearthed, such as bronze ding tripod, ge dagger, pottery jar, basin, stone and jade artifact, and artifacts related to chariots. Furthermore, a relatively well preserved entrance was found in the middle of the southern moat. The entrance was constructed on sterile layer and was broken by kiln and burial from later period. The dimensions of the entrance were about 4.0m from east to west and 3.2m from north to south. The entrance adjoined the moat in its north and surround by man-made moats on the other sides. Between the entrance and the outer moat was a drainage 0.6-1.1m in width and 1.2m in depth. The drainage was wider on top and narrow at its base. Two circular post-holes were found in the north of the drainage’s exist, a remnant of a doorway in the time was also found along the both sides of the drainage exist. From the result of the survey and excavation, it could not omit the existence of rammed wall in the site at the time of Zhou period. A lot of rammed earth fragments were found in the fill of the inner moat and inside the pits on the reddish brown clay. During the excavation in the western section of the upper portion of the “凸” shaped inner moat. A greyish white deposition with boulders was found in the eastern boundary of the reddish brown clay circle, it was about 0.1-0.2m wide. The nature of the deposition was very firm and might be a result of man-made alteration. However, unfortunately, it had been seriously damaged.